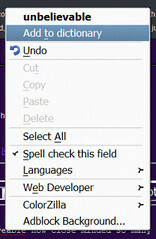 After accidentally adding a misspelled word to the Firefox 2.0 dictionary, I was scratching my head on how to get rid of that misspelled word. It seem like it should logically reside in the right click menu, or one of the Firefox menus. Logic aside, there was no easy way to edit the dictionary that I could see. A quick search on google revealed the answer: you have to edit the persdict.dat file. PS: Does anyone else find it funny that the Firefox spelling dictionary doesn’t recognise the word “Firefox”?